Our Conductive Gloves & Socks, are some of our most convenient treatment methods. These are a fast and light weight solution to your neuropathy needs for hands and feet whether you are traveling or relaxing at home. Below you will find a more in depth description of how to use them and take care of them. As always if you have any questions please call us! 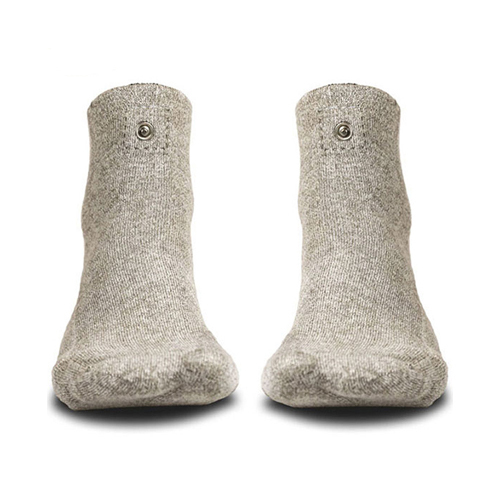 These specially made conductive socks allow you to elevate your feet during your treatment. This results in allowing gravity to help relieve edema, as well as, enhancing your blood flow during the treatment. This method eliminates the filling and emptying of the footbath. Additionally, many people like to use these in bed at night. Turn the conductive socks inside out. Holding the electrolyte bottle about 6 inches away, spray each conductive sock. 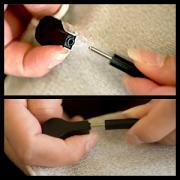 Apply the electrolyte evenly across the entire conductive sock until fabric is moist. Turn the conductive sock right-side out. Repeat spray to the conductive sock as necessary to maintain desired moisture level for your treatments. Elevate your feet in a recliner or chair, but DO NOT let the socks touch each other. If they touch, then the stimulation signal from the ReBuilder will not travel through your nerves. These specially made conductive gloves allow you to treat your hands for neuropathy pains. Additionally, many people like to use these in bed at night. Turn the conductive gloves inside out. Holding the electrolyte bottle about 6 inches away, spray each conductive glove. Apply the electrolyte evenly across the entire conductive glove until fabric is moist. Turn the conductive glove right-side out. Repeat spray to the conductive glove as necessary to maintain desired moisture level for your treatments. Sit with your arms on a table or rest your hands on your lap. DO NOT let the conductive gloves touch as it will prevent the ReBuilder signal from traveling through your nerves. 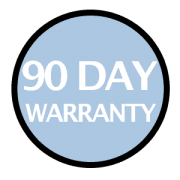 Our conductive garments carry a 90 day warranty against Manufacturer defects. If you have any warranty issues, then please call ReBuilder Medical Inc. The Snap connectors will be connected to the conductive garments. Simply connect the lead wire from the ReBuilder into the snap connector. You can also remove the snaps in order to connect to the lead wires. Note: It does not matter if the snaps are facing the inside or outside of your skin. Your conductive garments are intended to be used wet. It is suggested you gently hand wash them with mild soap as necessary. 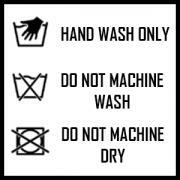 DO NOT machine wash or dry! For the snaps, unsnap the snap connectors from the lead wire and conductive garments. Then dry the snap connectors before putting them away. This will help maintain optimal function of your conductive garments. * These products are supplied as extra products for your convenience and may assist in the treatment of pain. * Many physicians will recommend these garments with use of electrical stimulation devices, however these garments are not necessary for use with ReBuilder products.